An ADE or drug error, is an injury resulting from the use of any drug (medicine). The goal is to prevent an adverse drug event from happening. Adverse drug events can lead to longer hospital stays or increased costs. Measuring our events, and comparing ourselves to other hospitals, helps us reach our goal of zero events that harm patients. 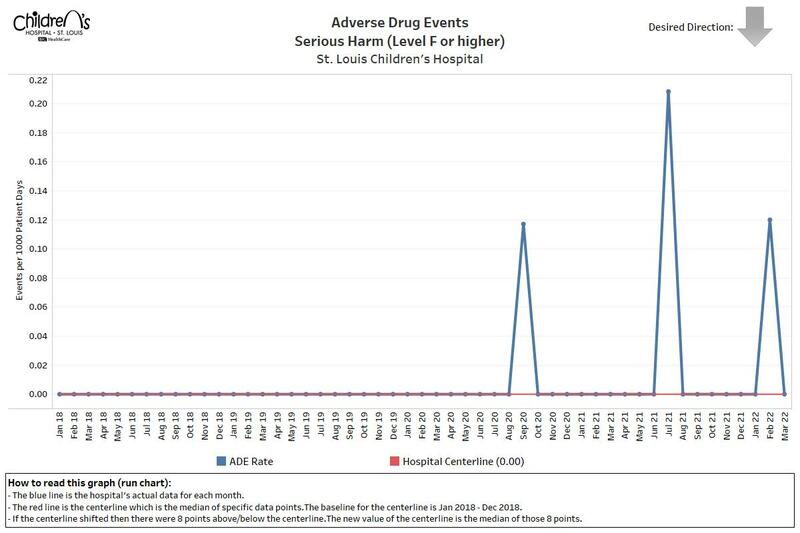 The number of adverse drug events that caused serious harm per 1,000 patient days. Employees are trained on how to report unsafe conditions or adverse drug events. This helps us stop an unsafe situation before a patient is hurt. If an adverse drug event happens, a team of pharmacists and clinicians reviews the event. The team looks at what went wrong and helps us find ways to prevent it from happening again. Make sure nurses and doctors caring for your child know about any allergies to medicine or food. Be as detailed as possible when you talk about the type of reaction your child had. Ask the medical team about the difference between anaphylaxis, allergy, and intolerance. Make a list of all medicines your child takes at home, including the dose and how often he/she takes the medicine. Bring this list with you to doctor’s appointments and to the hospital.